Objective: To study the clinicopathologic features of Castleman’s disease (CD), to review the treatment challenges in a group of Jordanian patients at King Hussein Medical Center, and to compare that with international data. Methods: This is a retrospective review of CD cases conducted at King Hussein Medical Center over 8 years (January 2009 to December 2016). A total of 21 cases of histopathologically diagnosed CD were enrolled in this study. Clinical data and histopathological parameters were analyzed and correlated among different subtypes of the disease with different outcomes and associations. Results: There were 14 males and 7 females. The median age of presentation was 40.1 years. Common symptoms include lymphadenopathy 76%, anemia 35%, abdominal pain 30%, splenomegaly in 19% of cases. Lymphoma was diagnosed in 10% of cases. The disease was localized in 15 cases and multicentric in 6 cases. Univariate analysis showed that most of multicentric CD cases presented with complications compared to localized disease (p value of 0.0002). Of multicentric CD, 2 cases were positive for Human Herpes Virus-8 (HHV-8). The results of Human Immunodeficiency Virus (HIV) were available in 15 patients, and no case was positive. Hyaline vascular morphology was the commonest histopathological pattern observed in 67%, followed by plasma cell 19%, and mixed type in 5%. 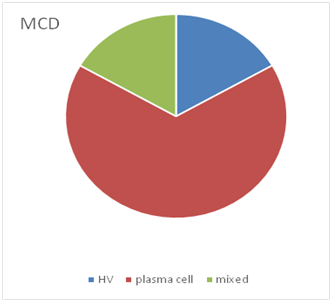 For all patients with localized disease, hyaline vascular was the only pathologic variant, whereas 4 out of 6 (66.6%) multicentric CD were of plasma cell type. Treatment of unicentric CD consisted of surgical resection, whereas for multicentric it was medical and 19 patients were followed up. Of these, 93.3% of unicentric disease remain symptom free without recurrence, while 2 cases of multicentric CD died, and the 3 others attained partial remission. Conclusion: Unicentric and multicentric CD are different clinical entities with overlapping histologic features. Most of the cases of Jordanian patients with CD exhibit an indolent clinical course with local surgical therapy. Further studies are needed to further elucidate the epidemiology, pathogenesis, clinical behavior, and optimal therapeutic regimens of this rare disease. Castleman’s disease (CD) describes a rare heterogeneous group of lymphoproliferative disorders characterized by massive growth of lymphoid tissue of unknown pathogenesis. (1)This entity was first described in 1956 by Dr. Benjamin Castleman who defined it as a distinct pathologic disorder. (1, 2)To date, only a few large series have been published because it is not only a very rare disease, but also a poorly understood entity. (3) The disease usually occurs in the third to fifth decades of life and it appears to have more predilection for men. The most common location of CD is the mediastinum, although in about 70% of cases, although it can be found at other nodal or extranodal sites. (1, 2,4) Clinically, CD is categorized into either unicentric or multicentric subtypes. Furthermore, there are three major histological subtypes: hyaline vascular, plasma cell, and mixed variants. More recently, a fourth sub-variant known as plasmablastic has been recognized. (5, 6) The histopathologic findings of CD can also be seen with other autoimmune diseases such as rheumatoid arthritis, systemic lupus erythematosus, and collagen vascular disease. So exclusion of these reactive entities is crucial before establishing the diagnosis of CD. (3, 4) Of note, multicentric CD overlaps either clinically or histopathologically with POEMS syndrome (Peripheral polyneuropathy, Organomegaly, Endocrinopathy, Monoclonal gammopathy M-protein and skin changes), which is a very rare syndrome and observed in 24% of CD patients. (3, 7) The clinical spectrum and course of CD varies widely among the different subtypes, ranging from asymptomatic or flu-like illness to multigrain failure and death. This is determined by dysregulated overproduction of interleukin-6. (1, 2, 6, 7) Moreover, several studies have revealed a pivotal role of Human Herpes Virus 8 (HHV8) in the pathogenicity of mutlticentric CD which has been detected in about 50% of this type. (8)It was also proved that HHV8 positive variants of CD have increased the likelihood for development of complications, such as lymphomas and Kaposi’s sarcomas. (6, 9) The purpose of this retrospective study is to describe the clinicopathologic features of Castleman’s disease (CD), to review the treatment challenges in a group of Jordanian patients at KHMC, and to compare that with international data. This study was conducted at KHMC over a period of 8 years (January 2009 to December 2016), and was approved by the ethical committee of the Royal Medical Services.A systematic search of our histopathology department data-base, revealed 21 cases of clinically and pathologically proven diagnosis of CD during the study period. The diagnosis of CD was established on the basis of light-microscope morphologic analysis of paraffin-embedded lymph nodes or other tissue specimens that were cut into 4 µm and stained with hematoxylin/eosin. Tissue sections were immunohistochemically stained by an automated immunostainer (Ventana system) using the following panels of monoclonal antibodies against: CD3, CD20, CD10, CD23, CD138 and latent nuclear antigen-1 (LANA-1) of HHV8 to identify the presence of HHV8 in CD or lymphomas associated with CD. Furthermore, patients diagnosed to have CD were tested for (HIV) infection, using Enzyme Linked Immunosorbent Assay (ELISA). The Castleman’s disease cases were first classified clinically, based on surgical findings and physical examination. Unicentric Castleman’s disease (UCD) was defined by the presence of histologic findings of CD at only one single region of lymph nodes, while mutlicentric Castleman’s disease (MCD) was considered if there were≥ 2 enlarged nodes stations involved by CD. (8,10) In all patients, CD cases were further sub-classified according to the histopathological characteristics of the involved lymph nodes or other tissue specimens into: hyaline vascular, plasma cell, and mixed variants. Clinical data and histopathologic characteristics of these patients were analyzed and reported, including patient’s age at diagnosis, gender, clinical presentation, site of diagnosis, centricity, histopathology type and treatment modalities . Follow up details were collected whenever possible. In this study, Chi square test (Pearson) was used to identify the inter-relationships between clinical parameters, pathologic variants with regards to treatment and clinical course of the disease. A P value of < 0.05 was considered as statistically significant difference. In total, 21 patients of CD were included in this study, of which 14 (66.7%) were males and 7 (33.3%) were females with more predilection for males. 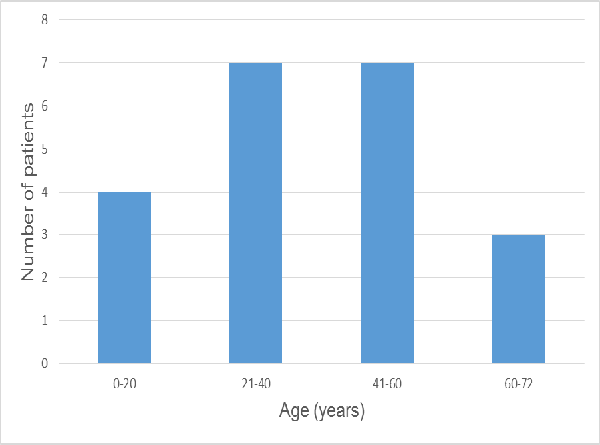 The median age of diagnosis for both males and females was 40.1 years, with 14 patients between 21-60 years. In this study, we only found 2 pediatric cases of CD, one 7 years old whereas the other was 13 years old as shown in Figure 1.Median follow-up was 28 months and the longest follow-up was for 5 years. The study results showed that the most frequent clinical presentation was slowly growing palpable mass which was observed in (76%) followed by anemia and abdominal pain in (35%) and (30%), respectively. Overall, 4 cases (19%) presented with huge splenomegaly,(14%) with B-symptoms (fever, fatigue, weight loss, and night sweats), and others non-specific symptoms like oral ulcers in about (17%) of studied cases. However, 3 patients(14%) exhibited no symptoms and were diagnosed incidentally as shown in Table I. Furthermore, we identified 2 cases of autoimmune hemolytic anemia (AIHA). Importantly, among our patients, 2 cases (10%) had been diagnosed with non-Hodgkin’s lymphoma 1 case prior to presentation and the other was high grade peripheral T-cell lymphoma arising in a background of CD).Moreover, because of the relationships between POEMS and CD, there were no sufficient features to diagnose POEMS in our patients, so we excluded this rare entity from the present study. In our series, the most common site of CD was the abdomen in 33.2% (mesentery: 3, retroperitoneal area: 3, peritoneum: 1), followed by cervical and axillary nodes 6 cases (28.6%) for each, thorax and others 1 case (4.8%) for each. Interestingly, one case who underwent radical nephrectomy was found to have a pelviureteric involvement by CD. Of all included cases, 15 (71%) patients were clinically classified as having unicentric CD while only 6 (29%) were diagnosed with mutlicentric disease. Grossly in resected tumors, the size ranged from 0.5 to 7.5 cm with no size relations among different sites of the disease. The Outcome analysis which was performed in the subset of 21 cases, showed a strong relationship between centricity and clinical complications. The MCD subtype was most commonly present in patients with complications including 5 of the 7 cases of anemia, 4 of the 6 patients with abdominal pain, and all cases that presented with splenomegaly, B-symptoms and AIHA were of multicentric type. Furthermore, progression to malignant lymphoma was reported in 2 of 6 MCD cases. In contrast, 10 of the 15 UCD cases presented only with regional lymphadenopathy, 2 patients presented with anemia and abdominal pain, and there were 3 cases of asymptomatic UCD with P value of 0.0002 which indicates a significant difference between the two disease patterns as shown in Table II and III. Microscopically, hyaline vascular (HV) was the commonest histopathologic subtypes seen in 16 cases (76%), followed by the plasma cell (PC) variant in 4 cases (19%), and only one case (5%) was of the mixed type. 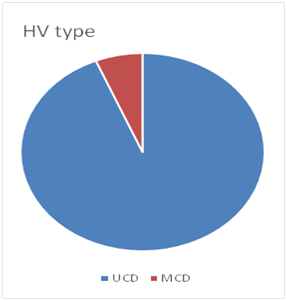 Regarding the pathologic findings, all the localized cases were of HV type (100%), while among the 6 MCD cases, 4 cases were of plasma cell type, 1 case of mixed variant, and only 1 case was of HV type. And all the 4 cases of plasma cell type were consistently multicentric in nature. Among the 16 HV subtype, 15 cases were unicentric disease and only one case was MCDas shown in Figure 2. Our study showed a strong relation between the clinical types and the pathologic variants with Chi square of 16.4 and P value of 0.0001 which indicates a significant difference among these types as shown in Table III. Regarding the HHV-8 status, we identified only 2 cases of muticentric disease which were HHV-8 positive in our study (one was of plasma cell type and the other was hyaline vascular). 15 out of 21 patient’s results were available for HIV infection and were negative, so HIV status was not reported in all patients. Because of that, data on HIV infection and its association with CD were excluded in this study. Among our patients, all localized cases underwent complete surgical resection of the involved tissues except one case where radiation therapy was used. While 6 muticentric cases, were treated by steroids alone as an initial therapy or in combination with other modalities like: rituximab, which is anti-CD 20 B- cell monoclonal antibody. 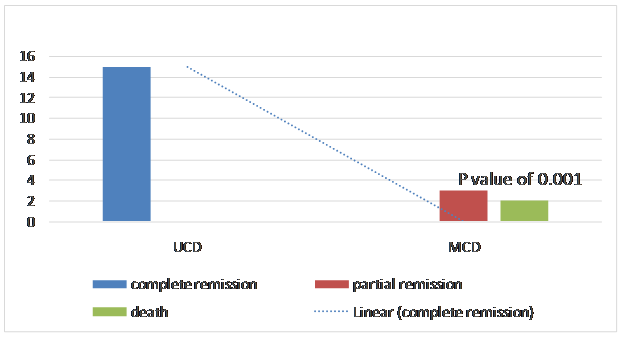 On follow-up, 14 cases (93.3%) of unicentric disease achieved complete remission with no recurrence of the disease, whereas there was no single documented case of MCD that has entered complete resolution of the disease symptoms. On the other hand, 2 patients (40%) who had muticentric disease died during the study period, and the 3 other multicentric cases attained partial remission with attributable risk of 0.933, Chi square of 15.5, and P value of 0.0001 which were considered significant values shown in Figure 3. Table III: Relation between clinical types, clinical complications and pathologic variants. This study had some limitations. First, some laboratory data were missed and not available because of the retrospective nature of this study. Second, the present study is performed on the experience of one single center in addition, the disease is very rare that created a bias. Therefore, nationwide scale study’s need to be conducted to assess the epidemiology, clinical spectrum, optimal therapeutic strategies, and possible targeted therapy for Jordanian patients with CD. Unicentric and multicentric CD are different clinical entities with overlapping histologic features. Most of the cases of Jordanian patients with CD exhibit an indolent clinical course with local surgical therapy. Further studies are needed to further elucidate the epidemiology, pathogenesis, clinical behavior, and optimal therapeutic regimens of this rare disease. 7.Dispenzieri A, Armitage J, Loe M, Geyer S, Allred J, Camoriano J, et al. The clinical spectrum of Castleman’s disease. American Journal of Hematology. 2012 Wiley Periodicals, Inc.